One of the most important goals in Writing for Mass Communication is helping students learn how to conduct effective interviews. Almost three-fourths of the students have never conducted an interview. They may have been interviewed themselves — for a job or for a scholarship — but they haven’t conducted interviews. Most of the students are very nervous about the prospect of talking to people they don’t know. We move them through the process in steps. They read chapters in the textbook about interviewing. We talk about interviewing — identifying a possible news story, determining what information/views must be obtained through interviews, what background research must be done, which people should be interviewed, developing interview questions, setting up the interview, and actually conducting the interview. The watch a recorded interview and take notes for a story. in lecture, we role play the dos and don’ts of interviewing. One of the activities we use is having a group approach to a story with me providing the expert sources. 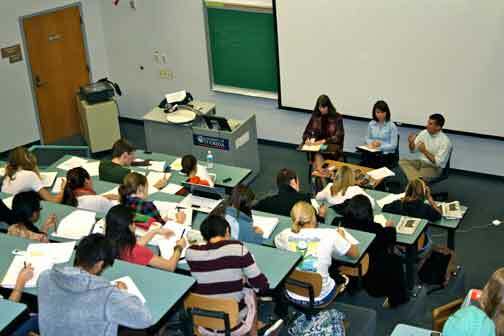 I determine a topic with a news angle and then invite or or two expert sources to lecture for a group interview. This semester our topic is the changes in the credit card laws that took place on Feb. 22 and the impact the news laws will/may have. Andrea Moore – communications manager for Card Services for Credit Unions, a national non-profit organization that works with 3,000 credit unions. Ross Jones — assistant manager for Campus USA Credit Union, with more than 65,000 members. An added bonus is that both received both their undergraduate and master’s degrees from UF. And Andrea is a former MMC 2100 student. In the lecture before the interview, I’d talked about the assignment. 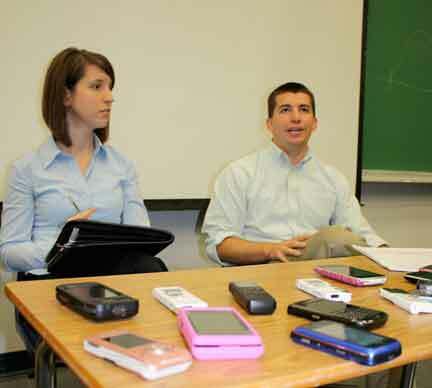 Most of the students were unaware that any change in credit cards laws was going to happen. Several were notably upset when they heard that people under the age of 21 (which is what most ot them are) would not be able to sign up for a credit card without a co-signer (a parent) or having a job that would enable them to pay their credit card charges. And that’s one of my goals every semester in selecting a topic is to select one that I think would be of personal interest to the students. For example, last semester, the topic was the H1N1 flu and how to avoid getting it. So I thought the topic of credit cards and establishing a credit history would be of interest to the students. Based on the interview questions they asked, I think they did find this to be a topic of interest. the new credit card act might be bad news for a few students who are below 21 yrs old since they cannot acquire a student credit card without a co-signer or grounds of independent income. But let’s consider the benefit of it. A credit card could actually help a student discover the true meaning of being responsible but allow us to not forget that many people who suffered bad credit as a consequence of incorrect credit card use. Bear in mind that how you handle your account can affect your credit history.